IDIL Fibres Optiques provides SM and PM optical circulators operating at wavelengths ranging from 630 nm to 1610 nm. Optical circulators are passive three-port device. They can be integrated into a box with bulkhead connectors. 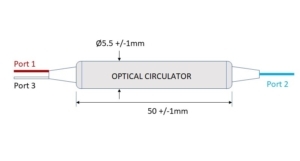 An optical circulator offers high isolation as well as low insertion loss. IDIL Fibres Optiques circulators are widely used in uni-directional operations for a wide range of applications such as bi-directional transmission systems, DWDM systems, Add-Drop multiplexing systems and sensing systems. IDIL Fibres Optiques circulators redirect signals at 780 nm, 1064 nm, 1310 nm, 1550 nm, 1610 nm. Other wavelengths and customization options are possible. Do not hesitate to contact the company. 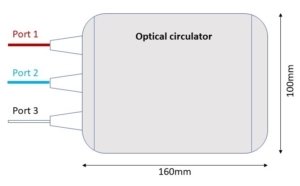 Optical circulators are specific three-port fiber optic components that redirect light in only one direction. 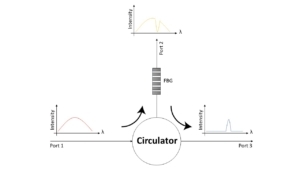 Example of application: To extract the desired wavelength, a circulator can be used in conjunction with a Fiber Bragg Grating (FBG), such as shown in the schematic.